Use plastic tongs or a plastic spatula when removing waffles from the grid. These tools are easier on the surface material. Don’t use knives, forks or any other sharp item. Freshly made waffles are a hugely popular, highly profitable breakfast item that have found a home on many menus beyond breakfast. Chicken and waffles, for example, are popping up in formats from quick service to fine dining. And operators are extending their use of the crispy, airy comfort food with creative (and sometimes crazy) applications, from sandwiches to desserts. Keeping your waffle maker clean is key to maintaining high efficiency throughout its lifetime. Bits of overcooked waffle batter turn to carbon, and carbon buildup acts as an insulator, slowing cook times. As cook times slow, internal components may overheat, causing the unit to fail. Additionally, that carbon can flake off and stick to waffles, affecting both appearance and flavor, and turning off customers. That said, waffle makers typically require little maintenance beyond simple daily care. Here are some tips. Waffle maker manufacturers agree that the grids should be cleaned daily. 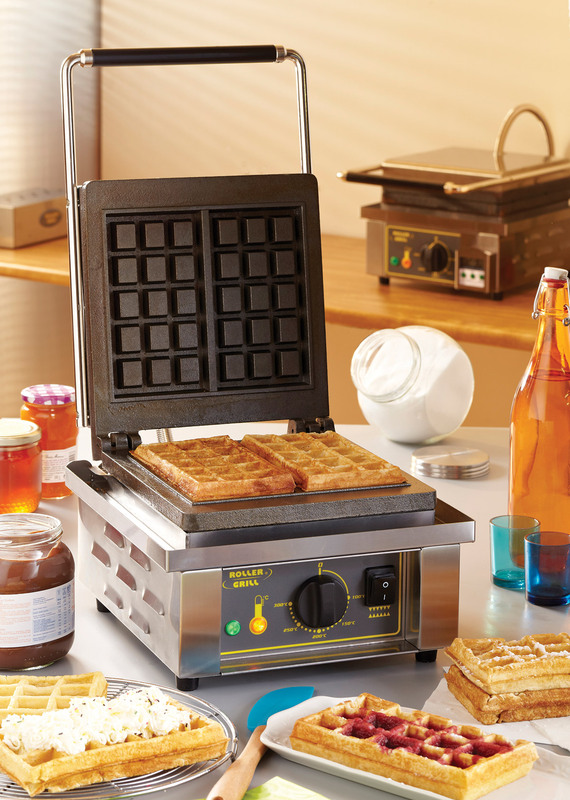 Many waffle makers feature removable grids to make the task easier. For high-volume operations, a second set of grids can keep turning out waffles while the first set soaks. It’s not just the shapes that vary among waffle makers. This unit comes with a removable drip tray to collect debris. Generally, waffle maker grids come in one of three materials—aluminum, nonstick-coated aluminum or cast iron—all requiring slightly different care to season and clean them. Aluminum. At least one manufacturer recommends seasoning new aluminum waffle grids with a nonstick agent before using the machine. Grids must be clean before spraying the surfaces and drying them for at least 30 minutes. Turn the unit on and let it heat for 30 minutes; the grids are now seasoned and ready for use. Re-season periodically to keep waffles coming off easily. If carbon builds up on aluminum grids, an aluminum-safe cleaner may be used. Nonstick-coated aluminum. This surface offers easier cleaning. After every batch or so, wipe crumbs from the grids with a non-abrasive brush. To clean excess grease from the grids, one manufacturer suggests turning the unit off and letting it cool, then placing a wet two- or three-ply paper towel between the grids and closing them. To avoid damaging the nonstick surface, do not use a carbon-buildup cleaner and use plastic utensils—not metal—when scraping away debris. Cast iron. Energy efficient cast iron grids retain heat longer than aluminum and need less time to heat to temperature between batches. Prior to the equipment’s first use, wipe off the machine oil that the grids are covered in for shipping. Next, season the plates: While still unplugged, spray plates with cooking oil, turn the unit on to between 300°F-400°F and heat the grids for 10 to 15 minutes. Turn the unit off, let the plates cool and wipe away any excess cooking spray with a lint-free cloth. Repeat this process, and then the seasoned grids are ready to begin turning out waffles. Do not use soap and water for routine cleaning of cast iron, as this will require you to re-season the plates. Instead, use a stiff brush to remove debris—first from the top plate, then the bottom. For excess carbon buildup that can’t be removed with a brush, one manufacturer recommends using a foodservice-grade degreaser to get the plates back in appropriate working condition. In addition to caring for the grids, owners should give the entire waffle maker a good cleaning at the end of every day. To clean the unit, turn it off and unplug it. Wipe the housing down with a damp sponge and hot detergent water. Rinse with a damp cloth and wipe dry. 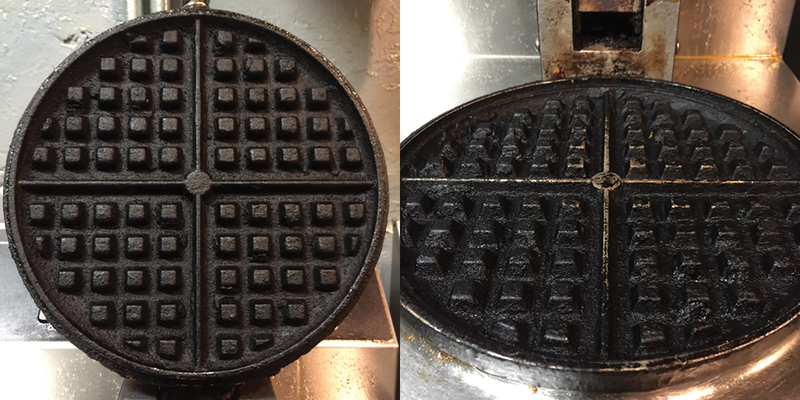 Both pictures illustrate poorly maintained, rarely cleaned waffle makers. Too much carbon buildup acts as an insulator and slows down the unit’s cooking speed. It’s important to train staff to clean any spillover from the surface of the waffle maker’s housing as it occurs. Letting spillover dry can create grease spots on the unit. While these spots do not affect the waffle maker’s operation, they are unsightly and can look dirty to customers in operations with open kitchens. Spills that enter the housing can damage internal mechanisms and cause the machine to fail. Using the recommended quantity of batter helps eliminate spillage and keeps food waste down as well. To avoid spillage affecting the controls, one manufacturer places its controls on the top of the unit, minimizing malfunction. Another maker offers a removable stainless overspill trough that protects the unit’s base. Remember to re-season cast aluminum grids every three to four waffles. This will keep waffles coming off easily. 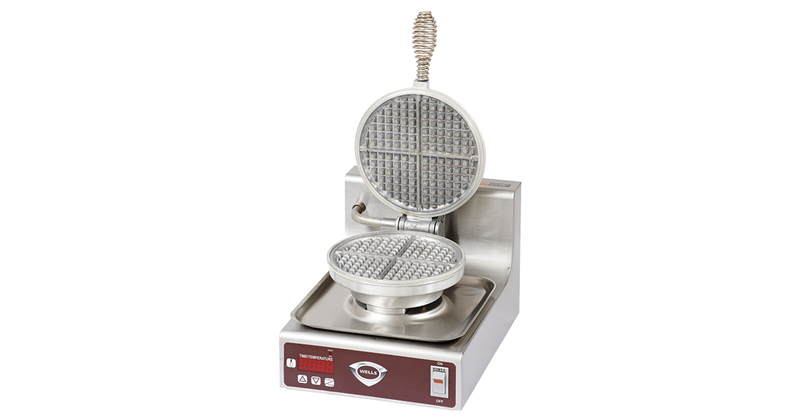 With proper cleaning, today’s waffle makers will turn out quality food for a long time. Consider replacing existing units with new ones if the thermostat or heating elements no longer work properly, although at least one manufacturer says that even these parts are easily replaceable by a qualified technician.